So I decided to start exercising this year. There’s a gym in my building, and now that I’m working home office it felt like the perfect queue to go back to sports. Well, it has become a habit now that I do some walking/running/weight lifting almost everyday. I started liking it and I have to admit that all that endorphin have been making me feel really well. Also, after reading an article about selfies and self-esteem, I decided to start posting my gym selfies. Because the truth is it motivates me and I’m learning to love my body and not be ashamed of said “defects”. After all, it’s not like exercising is only for those with six-pack abs. There are people of all sizes and shapes working out on the streets, gyms and parks. I’m allowing myself to be proud of my body and my daily workouts independent of clothes sizes, muffin tops, the amount of miles you run or pounds you lift. A healthy lifestyle is about loving ourselves and treating ourselves well, both inside and outside. 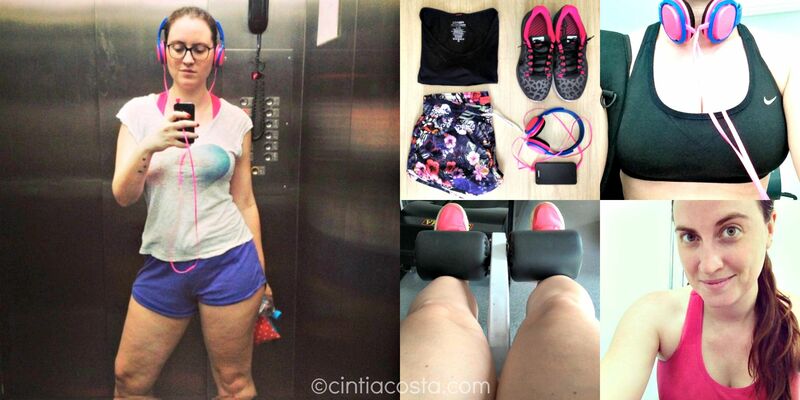 So that’s it: you can start calling me a fitness blogger and follow me on Instagram because I’ve only just begun :). You go girl!!! Work dat body!! !